Acerola Cherry: Can It Fight Disease? 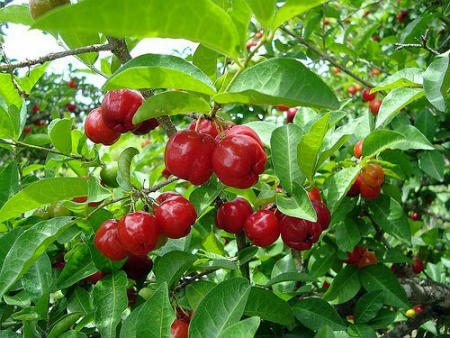 Acerola cherry: is it medicinal? What are the proven medicinal benefits of Acerola berry? I’ve written previously about the health benefits of acerola here, but here’s a more detailed answer about the proven medicinal benefits of Acerola, or lack thereof. The truth is that there is next to nothing to suggest that Acerola is especially adept at treating a particular symptom or ailment. It’s well established that the berry is extremely good for you, but there’s no link between Acerola and condition X the way there is between Milk thistle and liver health or ginkgo biloba and memory enhancement. (Maybe). The berry has only been used commercially for about 10-15 years and based on its nutrient profile there’s a good reason to believe it could do some remarkable things for your body, but it’s all heresay at the moment. Acerola is an amazonian berry that is fairly similar to acai, but for some reason doesn’t get the same amount of publicity. Not sure why. It might be a more powerful antioxidant, has a very high phenolic content and is one of the most potent sources of vitamin C on the planet. Young acerola can be almost 8% vitamin C by weight, which is almost 40x as much as an orange! Some of the phenolic compounds found in Acerola include proanthocyanidin, (? )-epigallocatechin gallate, and (?)-epicatechin. These compounds are similar to compounds found in other purple foods, berries, and green tea, all of which have shown to have unique healing properties. So it’s very reasonable to expect acerola to promote healing…….but you just can’t say for what, besides the generic claims like it might help your body improve its immune system, scavenge free radicals, etc. When thinking about the potential health benefits of Acerola it’s important to differentiate between those that come from compounds that are unique to Acerola and those that come from its high vitamin C content. The vitamin C in Acerola is absorbed very well, but the health benefits of ascorbic acid don’t differ from one food or the other and it’s not a scarce nutrient. When’s the last time you heard of someone suffering from scurvy? Vitamin C is also cheap, and there’s really no need to spend extra money getting your vitamin C from Acerola as opposed to anywhere else in your diet. Should You Buy An Acerola Supplement? If you’re thinking about buying an Acerola supplement you have two choices. You can either buy vitamin C that’s been derived from Acerola cherry or you can buy Acerola powder that’s simply a condensed form of the fruit. The vitamin C from Acerola can come in either a powder or pill form and is usually slightly more expensive than typical vitamin C tablets. There is no harm in taking more vitamin C than you need, but the vitamin C in Acerola is no different than the kind you would find in any other food. Buying acerola powder will allow you to digest the polyphenols and antioxidants which are unique to Acerola, but it’s not cheap. The berry only grows in latin america and one pound of acerola powder will typically run more than $30. The nutrients in Acerola are very fragile. The phenolic and vitamin C concentration in Acerola is typically highest when the fruit is immature and has a green appearance. Many of the more interesting foodstuffs in this fruit are heat sensitive and degrade easily, so you’ll want to buy acerola that’s spray dried and harvested during peak season. For this reason I’d recommend Mountain Rose Herbs to someone looking to buy fresh acerola powder. They pay close attention to their suppliers and their acerola isn’t heat treated. Another option is to purchase a greens powder or other superfood concoction that has acerola in it. The dosages will be much smaller but it’ll make acerola a much more affordable part of your daily diet. The ingredient isn’t especially unique in greens formulas and can be found in Amazing Grass, Dr. Schulze’s formula, and Incredible Greens, among others. Previous Post Don’t Be Happy. Be Interesting. I didn’t even know a cherry like that existed! Rickets is associated with Vitamin D deficiency not vitamin C deficiency, i think you mean scurvy. It’s nice to see an artcile on Acerola supplementation but i think you may be underplaying it’s importants over ascorbic acid supplements. Ascorbic Acid supplements are synthetic versions of Vitamin c usually made from GMO corn starch and arn’t necessarily a good thing, i always find they flare my skin problems up rather than improving them. I’ve recentyl ordered some Acerola supplements so hopefully should be with me soon. Getting most of your vitamins from whole food sources is always best imo because the body recognising them as food and as you say in your article the vitamin c from Acerola is more readily absorbed because it’s a whole food. Also Acerola is apparently more gentle on the stomach and contains other important vitamins and minerals such as beta-carotene , calcium, magnesium and potassium aswell as bio flavanoids all of which can be found in natural fruits but in acerola as a more concentrated form. As for regular vitamin C supplements….I agree. However I’d add that I think vitamin C supplements for most people are unnecessary since even a trivial amount of fruits and vegetables should give you enough of your RDI. I eat a lemon a day blended in filtered water first thing in the morning it detox my liver and kidneys and I get the real vitamin C ! ….no factory commercial vitamin c made from corn for me . I also eat organic vegetables and blend 2 times a day and jog 0ne hour a day .I lost 95 pound in 1 year . I don’t eat restaurant food or junk food .A clean diet with no toxins you liver will love you and you lose weight easy ! love your liver… healthy liver healthy body . Dear Jonathan. I was looking up info on acerola supplements when I ran into your article. Since you’re putting this out to the public., I thought I’d ‘ weigh in’ as I feel a number of your statements are not accurate. For starters (point 1): to declare that Vitamin C is Vitamin C no matter what is ‘dead wrong’. There is a world of difference between synthetic supplements (ascorbic acid) and whole-food derived supplements.. As you should know, the body does not utilize nor process, efficiently, synthetics compared to real food based elements. Real foods have innumerable ‘co-factors’, i.e. bioflavonoid complex in Vitamin C, that the food scientist’s kitchen cannot recreate. So, to hint that it can be a waste of resources (cost) buying, say, acerola over ascorbic acid because it’s all the same is a profound error! Next (point two): You suggest that given the general diet of the population, supplementation, as with Vitamin C is probably not all that necessary. Well, if you don’t really know, then I’ve got ‘news’ for you: the Standard American Diet (SAD- and it truly is) is wrought with nutritional deficiencies, including Vitamin C. Just LOOK at the population! Over consumption of animal protein, heavily refined carbohydrates, refined sugar, refined salt, etc., and you believe that!?! Over-fed undernourished- that’s us, the US. A general ‘plant-based’ diet of raw to minimally processed food is where you’re going to find life-force energy- real nutrients. And lastly (point three): For acerola processed to powder form, you state that obtaining spray-dried vs. freeze-dried acerola is your recommendation. I disagree. Freeze dried at low temperatures is the best way to minimize nutrient loss (a lot online about this), whereas spray dried does in fact make use of some chemical elements (i.e. maltodextrin- not good) in the process. If I sound ‘testy’ here and there, sorry, but information on natural health, that more and more people want, needs to be, in all instances, as accurate as possible. Thus I feel your presentation of acerola is lacking in some important accuracies.